A set of 12 full-size sheets 22 maps and plans 100 x 70 cm. (40 x 28 in.) covering the whole Bible epoch. 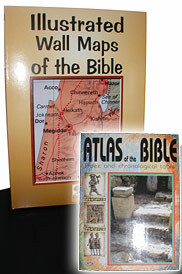 It is specially designed as a teacher's aid and can be used in conjunction with the Atlas of the Bible. The maps are large and clearly presented with no need for special equipment or lighting. They are ideal for use in school Sunday school Bible class Bible college or seminary as they are suitable for adults as well as children. These maps are an attractive way of bringing the Bible to life. The list of maps included in this package are: The Ancient Near East; The Old testament; The Hellenistic World; The New Testament and Key Maps of Palestine in the time of the Old Testament and Palestine in the time of the New Testament. A free ATLAS OF THE BIBLE accompanies this popular map collection and contains thirty full-color maps and city plans providing a comprehensive background for Bible studies.